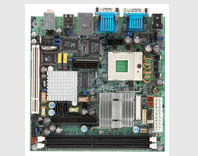 mini-ITX Intel 915GME and Intel ICH6M Socket 479, Pentium M / Celeron M, DDR400, Graphics, LVDS, 5.1-channel audio, 2 SATA, Gigabit LAN, 4 COM, 8 USB 2.0, Digital I/O and 1 PCI slot for customized riser card. 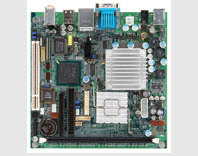 mini-ITX Intel 855GME and Intel ICH4 Socket 479, Pentium M / Celeron M, DDR333, Graphics, LVDS, 2-channel audio, 100Mb/s LAN, 2 COM, 6 USB 2.0, Digital I/O and 1 PCI slot for customized riser card. 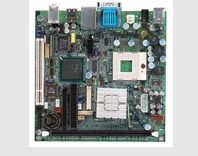 mini-ITX Intel 852GME and Intel ICH4 533FSB, 1 PCI slot or customized PCI riser card slot for 1, 2 or 3 PCI slots expansion, Graphics, LVDS, 2 Intel LAN and 4 serial ports. mini-ITX Intel 852GME and Intel ICH4 Socket 479, Pentium M / Celeron M, DDR333, Graphics, LVDS, 2-channel audio, 100Mb/s LAN, 2 COM, 6 USB 2.0, Digital I/O, 12V DC jack, 1 PCI slot for customized riser card. mini-ITX Intel 915GV and Intel ICH6 Intel Pentium 4 / Celeron D, Hyper-Threading technology, 800MHz FSB, DDR400, Graphics, S/PDIF-out, 4 Serial ATA, 2 Gigabit LAN and USB 2.0.
mini-ITX Intel 855GME and Intel ICH4 400FSB, 1 PCI slot or customized PCI riser card slot for 1, 2 or 3 PCI slots expansion, Graphics, LVDS, 2 Intel LAN and 4 serial ports.